We offer polished green abalone shells, hand selected out of our large inventory. The sizes available are from 4 inches up to 8 inches. The rough outer layer has been removed exposing a beautiful range of colors from deep blues to greens with undertones of silvers and mother of pearl. You are buying the shells pictured. 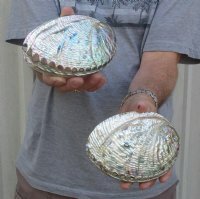 Wholesale pricing is available under the category: Polished Abalone Seashells in Bulk.